Her Name Is Sylvia: Wildfox - baby boy Tshirt. While I was pregnant I came across this super cute T-shirt from A Pea In the Pod Maternity and I had to have it! The saying is so sweet and means so much to me. Not only is it very cute but it is super comfy and perfect for postpartum - I love just lounging around in it while Im sitting around the house with Cameron. 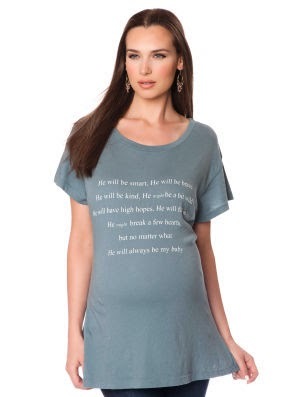 "He will be smart, He will be brave, He will be kind, He might be a bit wild, He will have high hopes, He will fall in love, He might break a few hearts, But no matter what He will always be my baby"
You can buy it here at Wildfox Tshirt - A Pea in the Pod Maternity.